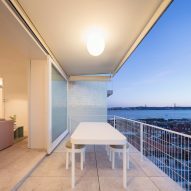 Portuguese office Rar Studio has renovated an Álvaro Siza-designed apartment in Lisbon to create a brighter and more spacious interior. 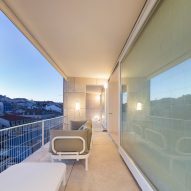 Apartment AMC is located in Lisbon's Chiado district in one of the blocks that make up Álvaro Siza's Terraços de Bragança development – a housing complex completed by the architect in 2004. 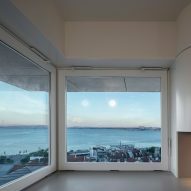 "Working within the scope of a Siza project represents a desirable challenge," said Rar Studio. 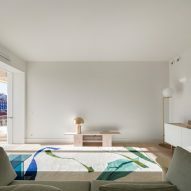 "The inexorable weight of the inherent responsibility runs in parallel to a sense of pointlessness of intervening within a framework that requires no such work. 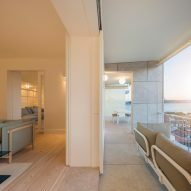 We thus focused on the needs, desires and expectations of the client," they continued. 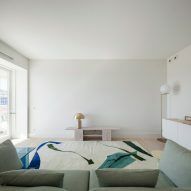 In order to create more space, the architects relocated the boxing-out and ventilation systems that were in the bathrooms, bedrooms, corridor, living room and storage room, to behind a suspended ceiling. 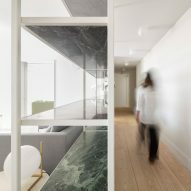 To create a clearer pathway through the communal spaces, the door from the corridor was repositioned and the wall that separated the living room from the dining room was removed. 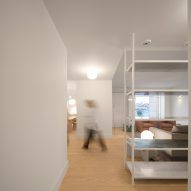 In addition, a wall of built-in shelving that separated the living room from the corridor was removed and replaced by an open shelving system that provides separation, while allowing light to be cast onto the corridor. 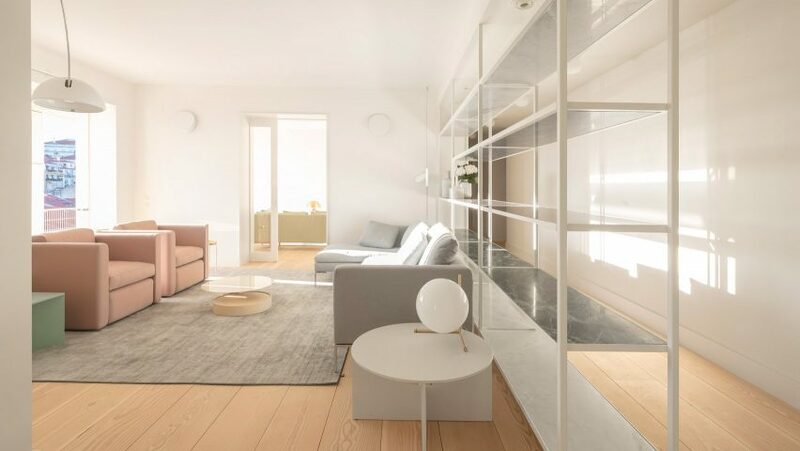 With the aim of creating a lighter ambience, existing dark wooden floorboards were replaced with lighter, broader planks. 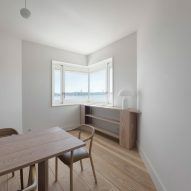 The apartment's internal doors were made taller to make them the same height as the windows, and thinner door frames and taller skirting boards with integrated ventilation grids were installed. 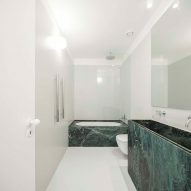 Ensuite and service bathrooms, as well as the kitchen and pantry, were all refitted with new fixtures and layouts. 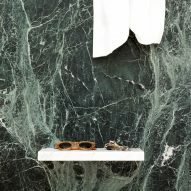 Baths, sinks and shower trays were realised in bold blocks of stone that sit in contrast to the white walls and tiled floors. 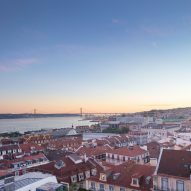 Rar Studio is a Lisbon-based architectural practice founded in 2015 by Rita Aguiar Rodrigues. 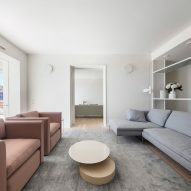 The studio has completed a number of interior projects in the Portuguese city, including the renovation of a 19th-century apartment, which features marble bathrooms and simple furnishings designed to complement its period mouldings.